I have an 11 year old Heil heat pump for an addition I had built onto the back of my house. This morning I go into this addition and the heat is running and it's incredibly hot back there so I switch the unit off. Several minutes later the unit is still running with no sign of stopping so I go outside to the box that has the disconnect switch. 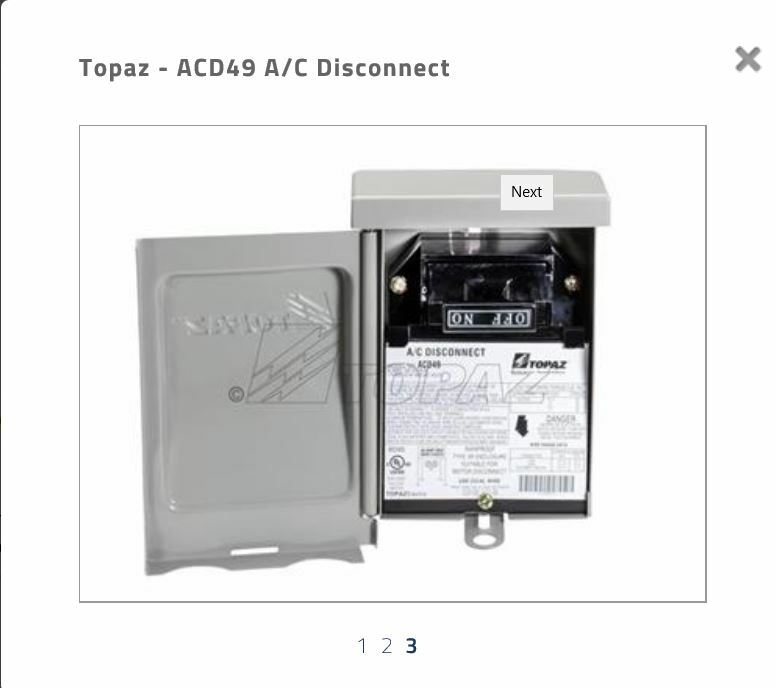 The switch looks just like the one in this picture (Topaz brand) and yes, the switch was upside down like in this picture. I pull the switch out and thankfully the unit stops running. Thinking it was installed incorrectly I plugged it back in with the label reading correctly (Off/On), no power. I pulled out the switch again and plugged it in with it reading On/Off in the upside down position like in the picture, now the unit has power again. Once again I pulled it out and plugged it in again as Off/On and of there is no power to the unit when plugged in like this. My question is do these disconnect plugs go bad or perhaps it's the whole box that is on the blink? It looks like it is working correctly to me. When the word ON is upright there is power out of the box. When you pull it out and turn it so the OFF is upright, you will not have any power comming out of the box. The one in the picture is not upside down. The ON is upright and OFF is upside down indicating power will come out of the box. Well, the box must be bad then as removing the switch is the only to stop the unit from running continuously. That is not a switch. It is just a pull out disconnect. Flipping it over so it says OFF NO is just where you store it when the power is off. Well, when I look it up on the internet it's called a disconnect switch. There is something definitely wrong somewhere when the unit will NOT shut off unless I pull this switch out. It is just a pullout disconnect. The HP running all the time might be the thermostat. That is what I would try first. Is it a solid state or old school with a mercury bulb? If it is solid state try pulling the batteries and see if it keeps running. It is a solid state thermostat and thanks for the tip! I'll pull the batteries out and see what happens. Trying to sort out all possibilities before picking up the phone and calling the AC/Heating man. Won't I jump for joy if it's something as simple as installing new batteries!?! I went through an assortment of high tech thermostats and now I have a round Honeywell T-87. It works every time. This thermostat is direct wired and no battery back up. It still could be bad. The only way to tell is disconnect the "heat" wire. (usually the white one) and plug the HVAC disconnect back in. See if the outside unit is still running. If it is just the inside fan that is running, try the green wire. Yellow is for AC and the red is the 24v from the air handler. That is a job for either the AC/Heat man or an electrician. There is no inside fan that I know of; could be but I'm not going to try to locate it. All I can say is I've had trouble with this heat pump from the first day it was installed. I might have gotten a lemon but it has not improved my opinion of Heil. This is a package unit? All in one piece, outside. You still either have a bad thermostat, shorted wire or a relay stuck closed on the unit. If you can't investigate beyond being sure the thermostat settings are right, you are calling the tech. I would think there is still something inside blowing air, either an air ha ndler blowing through ducts or if a split system, a through the wall fan. If the OP can't spot where the warm or cold air is coming from, I have litt le faith she can change a thermostat. I'm actually a little surprised she pulled the disconnect without getting hurt. I don't like pulling those und er load myself. That may be overcautious but I try to turn things off firs t when I can. handler blowing through ducts or if a split system, a through the wall fan. If the OP can't spot where the warm or cold air is coming from, I have li ttle faith she can change a thermostat. I'm actually a little surprised sh e pulled the disconnect without getting hurt. I don't like pulling those u nder load myself. That may be overcautious but I try to turn things off fi rst when I can. Could be as simple as a short in the thermostat wires, maybe from some rode nt. Whatever it is, if you have reasonable DIY skills you can probably fix it for not much, maybe $25 for a relay, worst case I guess it could be a control board. With a HVAC tech, you're pretty much at their mercy and they can hose you right proper if they want to. Yea, thay can really hose you. A couple of years ago on a Saturday the AC quit. Called the man and was told it would be a minimum of $ 100 for him to come out. Ok with that. He got here and replaced a bad motor capacitor in about 15 minuits. I was tlaking with him, and he was open and frindly. Gave me osme pointers about it. He then asked me what I though the capacitor would cost. I told him they paid less than probably $ 25 for it and the markup was about double , so $ 50. He said the company had a fixed rate of $ 300 for the capacitor repair. Later I ordered a capacitor and a relay he pointed out that often goes bad off ebay for about $ 30 total. Good thing I did as about 3 years later the capacitor went bad and I put in the one I ordered, then ordered another. Yeah. The local (but highly rated) HVAC repair charged me 85 to show up, a nd $250 for the cap. It was $12 at the local supply, but they wouldn't sel l to me as I'm not a contractor. On the other hand, some years back the other company in town, who'd put my heat pump in in that house, did sell me a special breaker for my air handle r. It was the middle of a cold snap, they were swamped and couldn't get to me for days, and they'd had a bunch of bad breakers on that unit so they w ere pretty sure what it was, and they gave it to me at cost. It was one of the easiest repairs I've done, in terms of taking the old one out and reco nnecting the new. But it was also one of the most physically difficult, be cause I had to half squat in my attic threaded between wires, tubes, etc., with no room to move and every muscle cramping. I'd have called these guys first but they've since gone under. Amazon and priority shipping? That's where I got a new condenser fan. $90 and it was here in two days. It would have been ~$350 for the fancy ECM one that was in it. I opted for a regular one. It would have to save a whole lot of electric to pay off that difference. The original one only lasted maybe 4 years, wasn't going to do that again. HVAC suppliers are real pricks when it comes to homeowners but they are not the only place that sells motor capacitors. I lucked up. Where I worked as an electrician and instrument person, the company put us through the refrigerent requeriments and got certified. I Showed up at the local HVAC supply company tossed out my card and walked away with a 20 or 30 pound can of refregerent. Auxillary Genny without an xfer switch - Legal??? Turn off a heat pump toaster? If HVAC No Longer Around: What Happens ? 12 amp a/c (2001) blows 15a type sl fuses? Sanyo Ductless Mini Split Air Conditioners? BLOWING FUSES PART 2 !!!!!!!!!!!!!!!!!!!!!! CH off or turned down ? ?